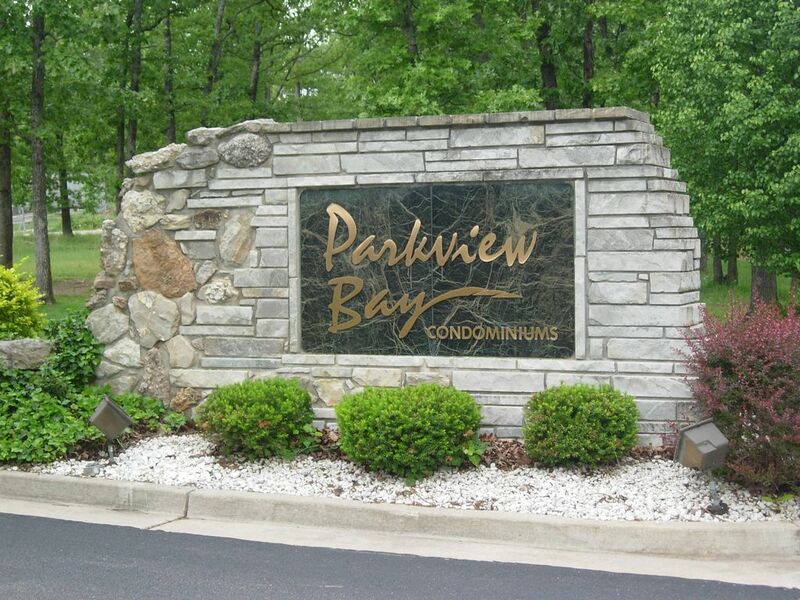 Parkview Bay condos are located right on the water at the 2mm of the Grand Glaize Bridge at the Lake of the Ozarks. Nestled in the heart of the State Park you will be able to enjoy an uninterrupted view of the shoreline. Located off Lake Rd. 54-29, you are just minutes away from the Outlet Mall. When you're done shopping stop by some of the greatest restaurants. Enjoy miniature golf, go carts, music shows, fishing and much more. There is something that is offered for everyone. This condo sleeps 11 people. The unit has elevator access and is handicap accessible. Kitchen is fully equipped with all the necessities. The dining area has a large table that seats 8 people plus three bar stools. The family room has a large sectional couch with a queen size sleeper, flat screen cable/TV/DVD. Sliding doors open out onto a screen in deck overlooking the lake. The front bedroom has twin beds with its own full bathroom and ceiling fan. The 2nd bedroom has bunk beds which sleeps three and has ceiling fan. Master bedroom offers king size bed, double vanity, tub and shower with Jacuzzi jets in tub, cable/TV. Guest bedroom offers a queen size bed, double vanity, tub and shower, with a picture window looking out at the State Park. Boat slip 16x40 at an additional fee $20.00 per night. We loved staying in this condo at the Towers. It has tons of space and an excellent view and is a great location on the lake. Excellent amenities. Lovely, updated space big enough for the whole family. We love this condo and the fact that we can all stay in the same condo. We all have a bedroom that has our own bathroom. The kitchen is upgraded and we love the indoor pool for the kids. We love coming to the Towers every Presidents Day! Wonderful Condo and vacation experience! There were 9 of us vacationing during Labor Day weekend. The condo is spacious for us all. The bedrooms are spread out all on the main floor. Three of the bedrooms have their own bathrooms. Sometimes we would run out of hot water, but there were 9 of us. We will be back. It was exactly as presented. Spacious, nice and all amenities! Our family enjoyed ourselves greatly! We plan to come back next year! Wonderful place..wonderful trip! Wonderful condo for our family group ranging in age from 5 to 96! Accessible to elderly, but with pool for the younger ones. Good location and close to state park. For the most part, very well equipped. The huge dining table that seated all of us was great! Owner responded promptly to all of our questions, and even a minor plumbing issue that arose during our stay was attended to promptly. Thanks for sharing your condo with us! A minimum of 2 nights. If you stay 7/nights will only be charged for 6/nights. $375 Refundable Security Deposit to Confirm Reservation. Balance due two weeks prior to stay. Two weeks notice required for cancellation, or will lose deposit.